A punk house is a dwelling occupied by members of the punk subculture. Punk houses are similar to the hippie crash pads of the 1960s and the slan shacks of science fiction fandom. The Factory, an alternative living space founded by Andy Warhol as the home base of The Velvet Underground, is directly linked to the formation of punk rock in New York City. In the early 1980s, a few punk gangs developed around allegiance to certain punk houses. Punk houses are often centered on certain political or personal ideologies. It is not uncommon for a punk house to be anarchist, strictly straight-edge, or vegan. A clique of punks may start a punk house by squatting an abandoned building, by renting, or by owning property. Punk houses are often communally inhabited in an attempt to minimize the individual expense of rent or property tax. Punk houses serve as backdrops for local scenes; punk houses often provide overnight shelter to touring punk rock bands, and sometimes serve as a venue for shows. Bands or record labels sometimes form in a particular punk house. Many punk houses have associated punk zines that sometimes share the name of the house. 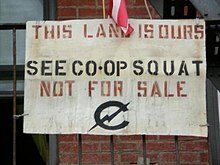 Groups of anarcho-punks run their houses as communes. Inhabitants sometimes identify their houses with unique names and symbols so they can represent their residence with clothing, slogans, and graffiti. The Ashtray, West Oakland, CA - A Late 80's punk house home to members of Operation Ivy, Isocracy and Filth. Mentioned in numerous fanzine articles and songs including those of Absolutely Zippo, Cometbus, Screeching Weasel, The Lookouts and Blatz. Lost Cross, Carbondale, IL - A house serving as a practice space, venue, and hangout continuously since 1986. Calgary Manor, Calgary Alberta - venue occupied by members of Calgary punk scene and featured in the film Another State of Mind. C-Squat, New York City – Residence and music venue; occupied by members of Leftöver Crack and other punk bands. Die Slaughterhaus, Atlanta, GA – residence, venue and record label; occupied by members of Black Lips, Deerhunter and other bands. Positive Force House Arlington, Virginia – former residence of Positive Force D.C. The BFG, Appleton, WI - venue occupied by members of Tenement, Wartorn, Technicolor Teeth, and The Parish. Storey House, Santa Cruz, CA - A longtime venue for touring bands, couch for traveling punks, and home to about fourteen weirdos. The Rat Palace, Vancouver, Canada - Legendary punk house on Broadway near Arbutus, active from late 70s to mid-80s. The 309 House, Pensacola, Florida - Active since at least 1978.
Notable punk rock songs that mention punk houses include: "Punkhouse" and "Ashtray" by Screeching Weasel, "Homeo-Apathy" by Leftöver Crack, "Party at 174" by The Bouncing Souls, "Kids of the Black Hole" by The Adolescents, "Toxic Toast" by the Mighty Mighty Bosstones and "Landlords" by Pinhead Gunpowder. Aaron Cometbus chronicled his experiences in a punk house called "Double Duce", in a novel of the same name. Photographer Abby Banks released Punkhouse: Interiors in Anarchy, a book of punk house photography that catalogs many such places in the United States. Sonic Youth frontman Thurston Moore edited the book. Punk houses have served as settings for a number of punk films, including Suburbia, "The Taqwacores (film)", and SLC Punk!. ^ Green, Penelope (January 3, 2008). "Anarchy Rules: The Dishes Stay Dirty". The New York Times. Retrieved September 26, 2011. ^ Agnew, Meaghan (December 13, 2007). "Dirty, chaotic, comfortable - welcome to the punk house". The Boston Globe. Retrieved September 26, 2011. ^ Leitko, Aaron (December 18, 2009). "The Orange Line Revolution". Washington City Paper. Retrieved September 26, 2011. ^ DuBach, Jared (November 17, 2005). "Carbondale's music legends remember the '80s". Daily Egyptian. Retrieved September 26, 2011. ^ "Youth Brigade Interview - Shawn Stern". ThePunkSite.com. June 18, 2009. Retrieved September 26, 2011. ^ Andersen, Mark; Jenkins, Mark (2009). Dance of Days: Two Decades of Punk in the Nation's Capital. New York: Akashic Books. pp. 168–169. ISBN 978-1-933354-99-6. ^ Pascale, Arthur (October 31, 2008). "DIY Venue Spotlight: The BFG". ALARM Press. Archived from the original on March 3, 2009. Retrieved September 26, 2011. ^ Cometbus, Aaron (2003). Double Duce. San Francisco: Last Gasp. ISBN 0-86719-586-X. ^ Banks, Abby (2007). Punkhouse: Interiors in Anarchy. Abrams Image. ISBN 0-8109-9331-7. ^ Hix, Lisa (February 13, 2008). "Punk style at home in Oakland's Purple House". San Francisco Chronicle. Retrieved September 26, 2011.